Easy up/down hike. Natural bridge is only marked by a bench. Easy up/down hike. No shade! Take water! Natural bridge isn't marked per say, but there is a bench to sit & enjoy the view right there. A couple creek crossings would be diffucult after rain-if it only it would! We took my mother in a push wheel chair from the trail head closest to the natural bridge & prarie dogs. Very sandy, & at times difficult pushing/pulling but we made it to the bridge. As always caprock canyons is one of my favorite state parks in Texas. The traffic is always low at this park which is a shame for a hidden gem. I'm sure it has a lot to do with it being so far off of the beaten path. Eagle point trail is on of my favorites. Its 2.1 miles long so it makes for a nice evening hike or early morning warmup hike. Lots of red rock and gypsum traces in the rock. The combination always fascinates me. The Eagle Point Trail is a nice, scenic hike. The trailhead is just off the road and takes you out near Lake Theo. Along the way, you'll encounter some small hills and scenic canyon views. If you don't have a lot of time and/or you want to do one of the shorter, scenic hikes in the park, I would recommend this trail. My wife and I hiked this trail taking turns carrying our son in a backpack carrier. We left around 9 am and the weather was in the 50-60s and overcast. The trail is easy to follow and was bladed the entire length. It has a few steep spots but is generally a gradual slope down to the creek bed if coming from the south end of the trail by the pavilion. The natural bridge is under the bench if want to look for it too. Other than some up and down parts over some mild hills, this is an easy hike. We enjoyed going through the 'tunnel' of the natural bridge. Definately take a ton of water to tackle this park. 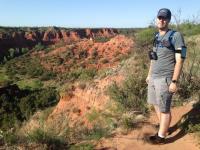 It's an enjoyable park but is often overlooked being so near Palo Duro Canyon. This trail allowed for various nice outlooks along the way. My mistake was hiking the trail in reverse. This park is full of several steep grades. The trails are built to help the hiker with conquering these grades. Doing the trail in reverse, I ended up fighting the extreme grades in certain areas. It was a challenge but we had a good time with the canyons. This was a nice little hike that wasn't too difficult. 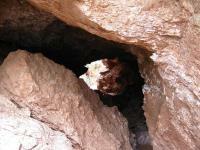 One of the interesting features is a natural bride that the trail utilizes crossing a small ravine. I also spent some time wandering through one of the many small canyons that cross through here. Some very interesting erosion features taking place in the Gypsum layers there. Hiked this beauty in the Caprock Canyons around noon on a HOT June day. However this was the place to be as there were only two other people in the entire park. The trail starts off on the grassy edge of one of the canyons and descends down into it. The red dirt trail then meanders through the canyon passing several bluffs and creeks along the way until you reach Eagle Point, which is beautiful. This was one hot trail during the summer so be sure to pack plenty of water.